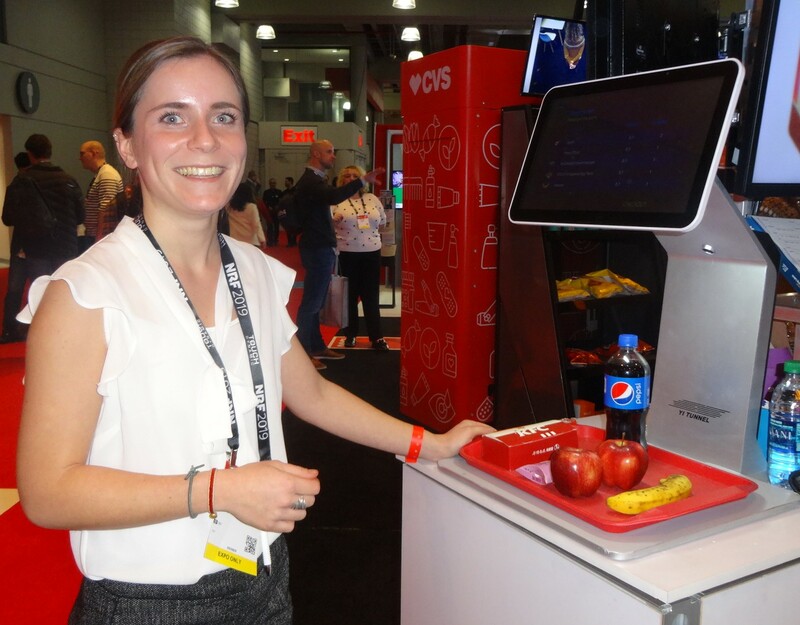 Self-serve kiosks were dominant on the trade show floor, offering a range of technologies such as artificial intelligence, robotics, virtual reality, augmented reality, facial recognition, voice recognition, machine learning, advanced analytics, digital currency acceptance and more. 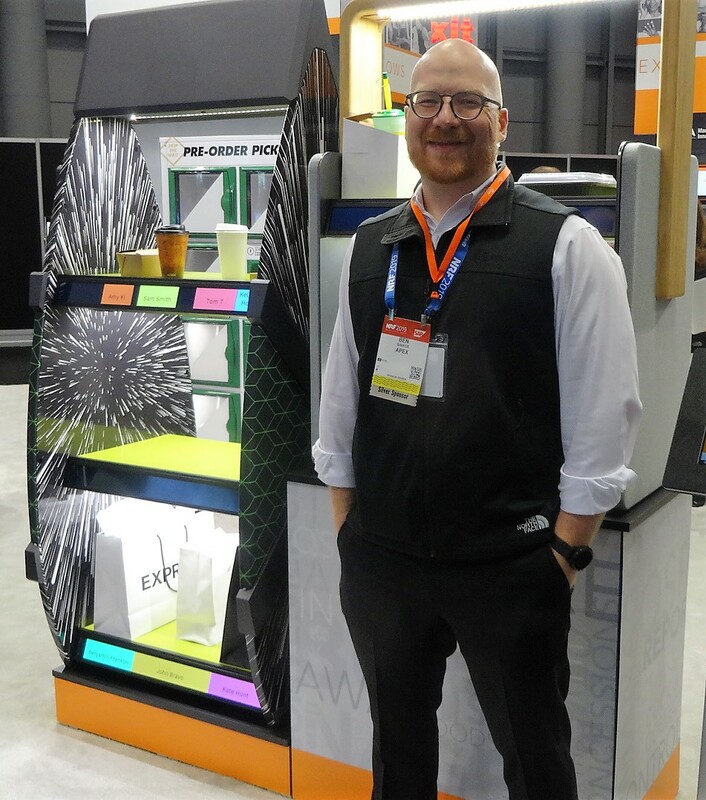 The cashierless store concept — spearheaded in the past year by Amazon Go — has spawned scores of competitors, several of which were on display at NRF. And, of course, many of the displayed systems pertained specifically to the restaurant order-and-pay vertical that so many QSRs are turning to, while so many more are pondering these tools. 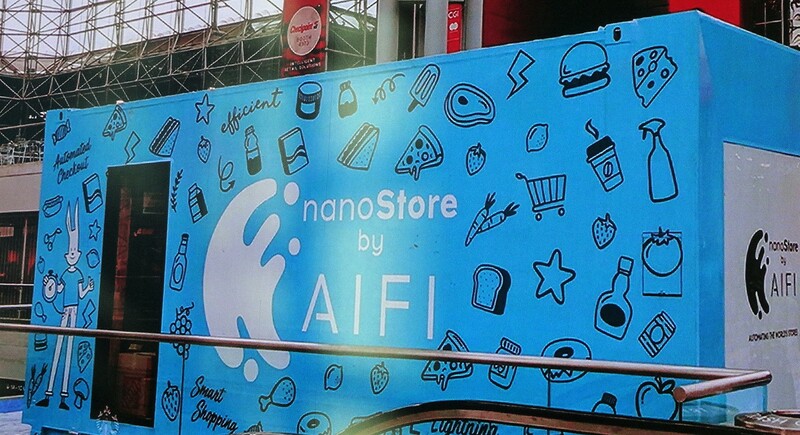 Aifi, a technology provider, introduced its NanoStore, an automated store powered by artificial intelligence. The Nanostore uses AI algorithms for real-time customer tracking and product recognition, as well as camera technology and systems that can track thousands of shoppers. The technology is built into the store along with store fixtures and refrigeration. Customers in the NanoStore can simply swipe a credit card or tap an app, select their items and walk out without the need for onsite personnel to complete their transaction. Receipts are generated in near real time, and the entire shopping journey can be completed in seconds. The Aifi Nanostore uses AI algorithms for real-time customer tracking and product recognition, as well as camera technology and systems that can track shoppers. 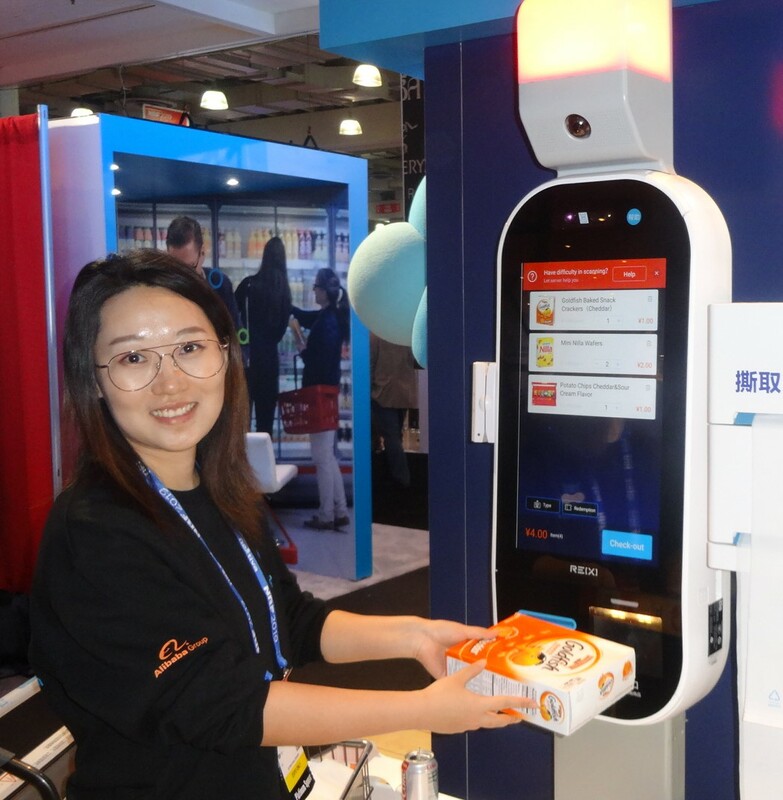 Alibaba Group’s Freshippo supermarket chain demonstrated its AI-powered express checkout that might hold potential for some QSR brands. It allows users to pay by scanning a card or via facial recognition. The kiosk is programmed to alert an associate if the customer needs help checking out. The company plans to introduce the unit in the U.S.
Wenting Li shows the Freshippo express checkout at the Alibaba Group booth. Apex Supply Chain Technologies introduced its “smart shop” order pickup for foodservice locations. The Bluetooth-powered shelf flashes the customer’s name when their order is ready for pickup. The software tracks when orders are placed and when they are picked up. Orders can be placed and purchased online or at a kiosk onsite, like those Little Caesars uses currently. Ben Savage presents the “smart shop” order pickup solution at the Apex Supply Chain Technologies booth. Busin, a China-based self-service technology provider, presented its Android-based restaurant self-checkout kiosk, which uses a facial recognition camera to identify the customer. The kiosk, which is used by some American restaurants in China, also features a printer, barcode scanner and PIN pad. 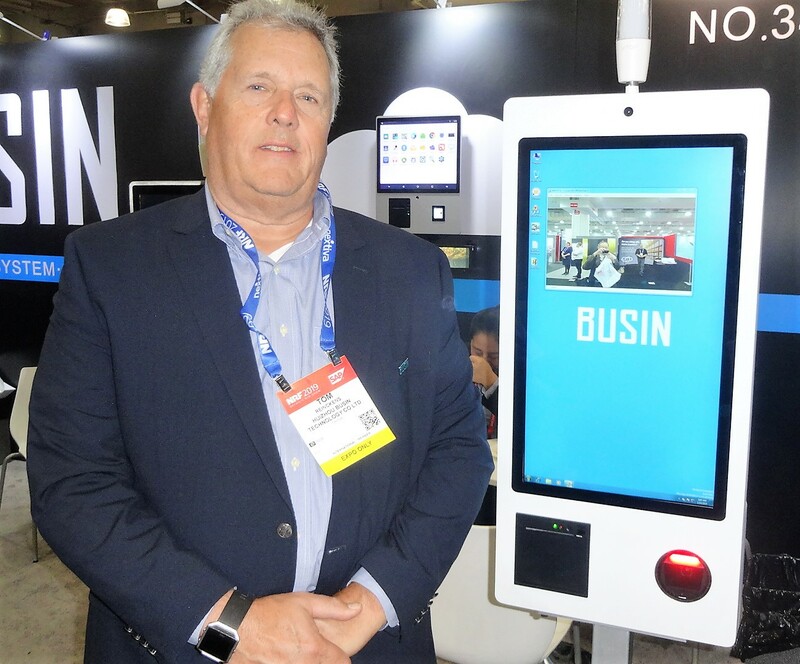 Tom Reinckens presents the self-checkout kiosk at the Busin booth. Diebold Nixdorf demonstrated its Vynamic Retail Software Suite. In partnership with Google, Vynamic Demand and Vynamic Engage enable retailers to close the loop on digital advertising from mobile and online all the way through in-store and point of sale, providing retailers with specific ad attribution statistics. 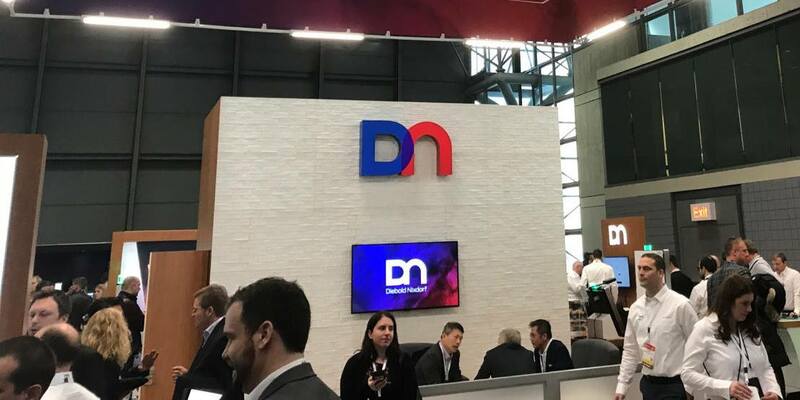 Diebold Nixdorf has also partnered with Instagram to offer similarly personalized advertising via the popular social platform. Another exhibit showed how consumers can initiate a request through their smartphone via Vynamic Mobile Retail for help or information on a product in an exact location in-store. The service request is sent to all store staff along with the location of the consumer. To further personalize the shopping experience, Vynamic Mobile Retail supports promotions related to shoppers’ actual position and profile using Vynamic Engage. Diebold Nixdorf also presented its Storevolution Advisory Services, which designs the transformation of the retailers’ checkout zone by utilizing self-service technology such as the Beetle/iScan eXpress, the K-two, or personal self-scanning devices, paired with RFID technology or artificial intelligence. Retailer-specific integrations of self-service technology enhance the consumer experience, stimulate personalized consumer interactions and, therefore, drive sales, the company said. Also on display were solutions specifically geared towards quick service restaurants, including a smart fridge that uses weight recognition technology to add an item to the customer’s order (and initiate an automatic re-order), and image recognition connected to self-service kiosks to automate the checkout process. 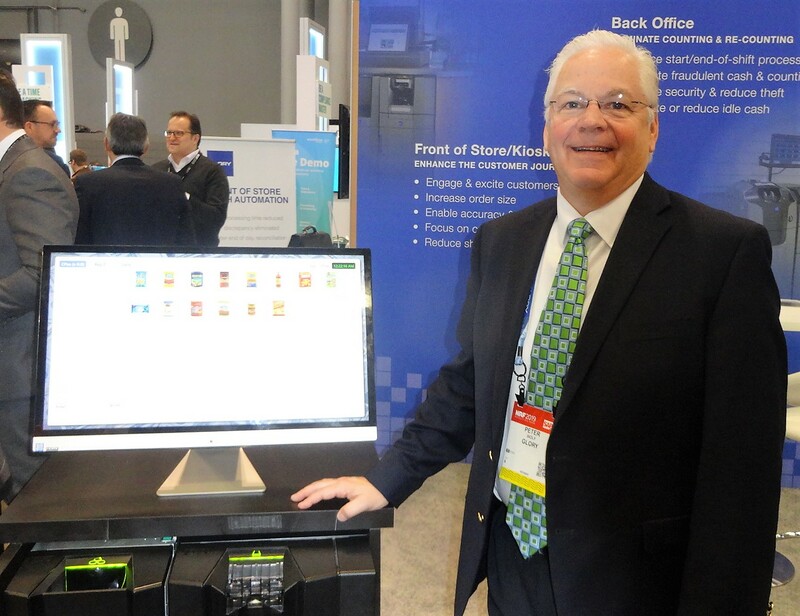 Diebold Nixdorf also demonstrated its Vynamic Retail Software Suite and other offerings. Diebold Nixdorf demonstrated its Vynamic Retail Software Suite and other offerings. Elo demonstrated EloView software designed to simplify deployment, management and security of kiosk devices and content, helping to create a consistent experience for every customer visit. The EloView solution enables management of self‐order kiosks from a central location, reducing operating costs while improving uptime and security. Available touchscreen displays include the company’s versatile 22‐inch I‐Series built for high‐traffic environments. Elo also announced additions to its point-of-sale and self-service solutions, including the EloPOS system, Elo PayPoint Plus for Windows, and the 1302L touchscreen monitor, according to a press release. 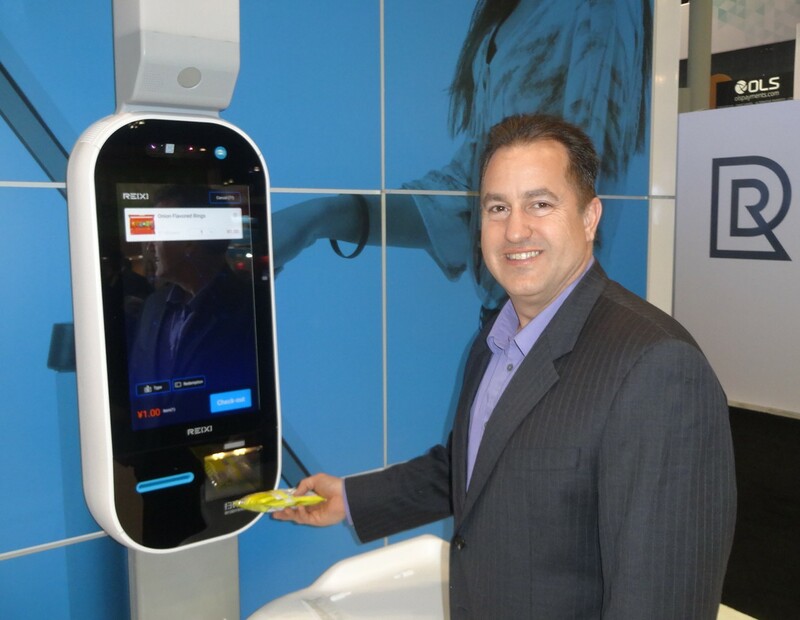 John Lamb demonstrates a self-checkout solution at the Elo booth. FEC demonstrated a prototype of an artificial intelligence-powered checkout kiosk that uses a camera to identify products on a tray. The unit will be available in the first quarter of 2019. 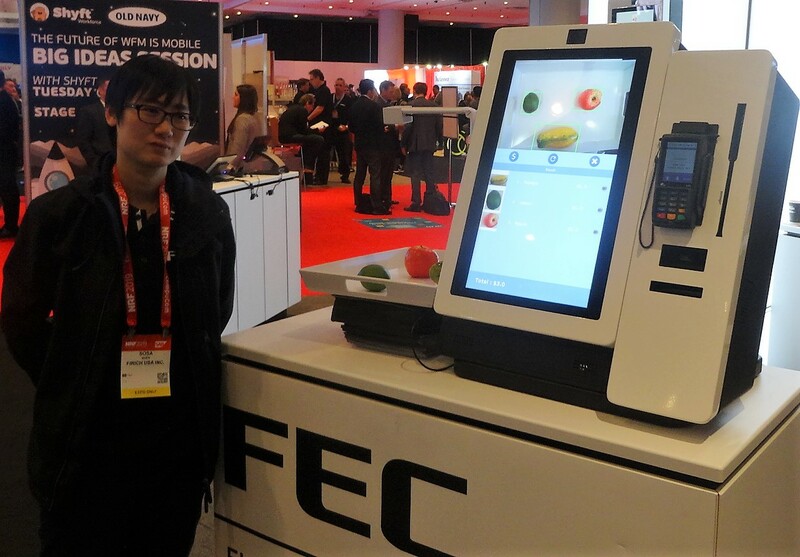 Sosa Chen presents the FEC prototype checkout kiosk. Glory displayed its C1-50 banknote and coin recycler for low-volume cash locations. The solution can be used on a self-payment kiosk as well as in a back office. The unit is designed to improve cash handling in any retail environment. Peter Wolf shows the C1-50 at the Glory booth. Hitachi’s sanitary touch-free interactive signage uses machine vision to convert pointing gestures into on-screen selections. The user points to a selection without touching it, preventing the transfer of germs to the screen. The software records customers’ selections and their demographics. 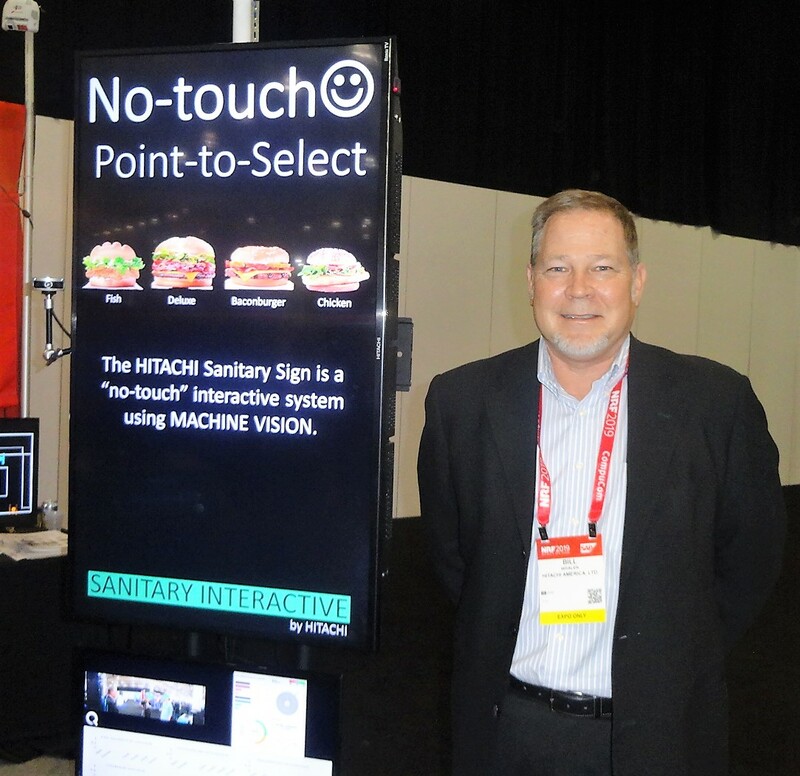 Bill Whalen shows touch-free interactive signage at the Hitachi booth. ID Tech introduced the VP6800, an all-in-one, PCI PTS 5.x-certified unattended payment device containing a 4.3-inch digital touchscreen display that supports PIN on glass. The VP6800 joins the company’s line of unattended payment solutions. 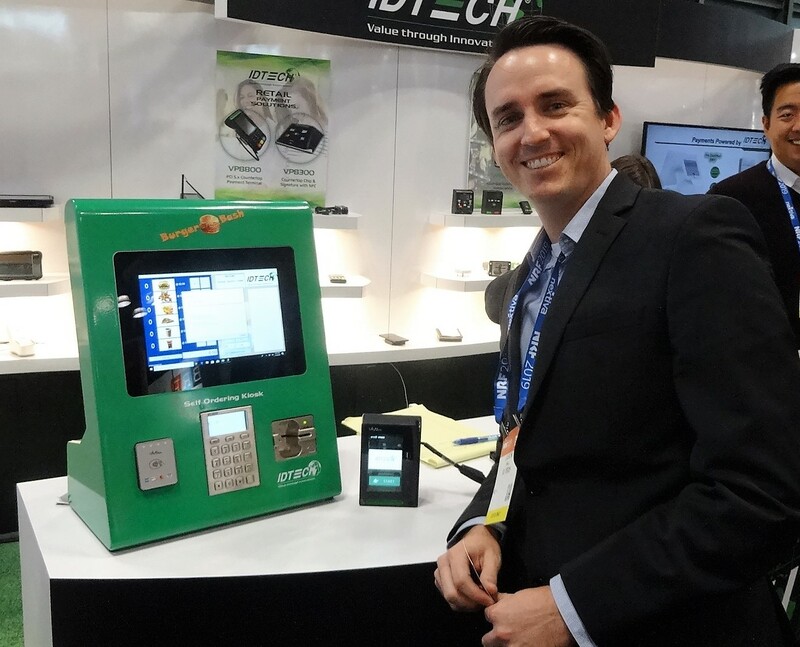 Jason Hall presents the new VP6800 unattended payment device at the ID Tech booth. 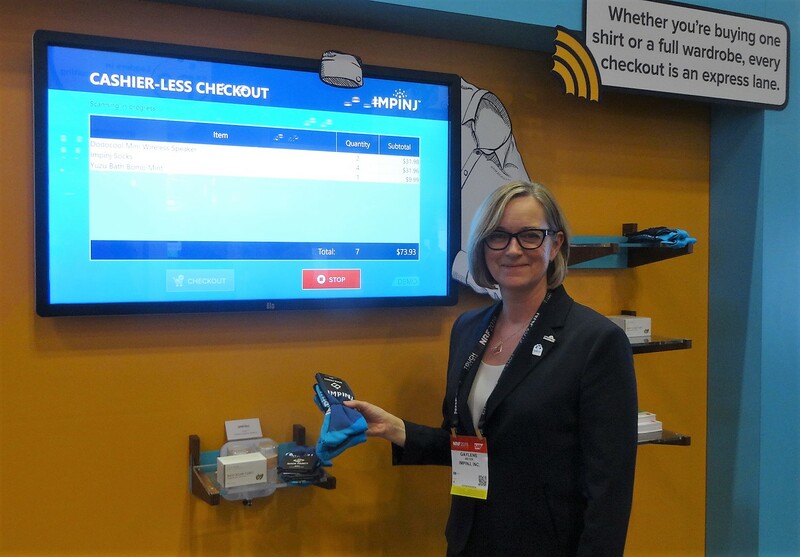 Impinj, a provider of RFID solutions, demonstrated a cashierless checkout solution for retailers. The company’s connectivity devices include RFID readers, gateways, reader chips and modules that connect items wirelessly to consumer and business IoT applications. Gaylene Meyer presents the cashierless checkout solution at the Impinj booth. Ingenico Group presented its unattended partner program, which provides access to its PCI-certified, NFC- and EMV-enabled iSelf Series solutions. Members of the program — kiosk providers, value-added solution providers, system integrators and payment solution providers — comprise the ecosystem necessary for secure unattended payments. 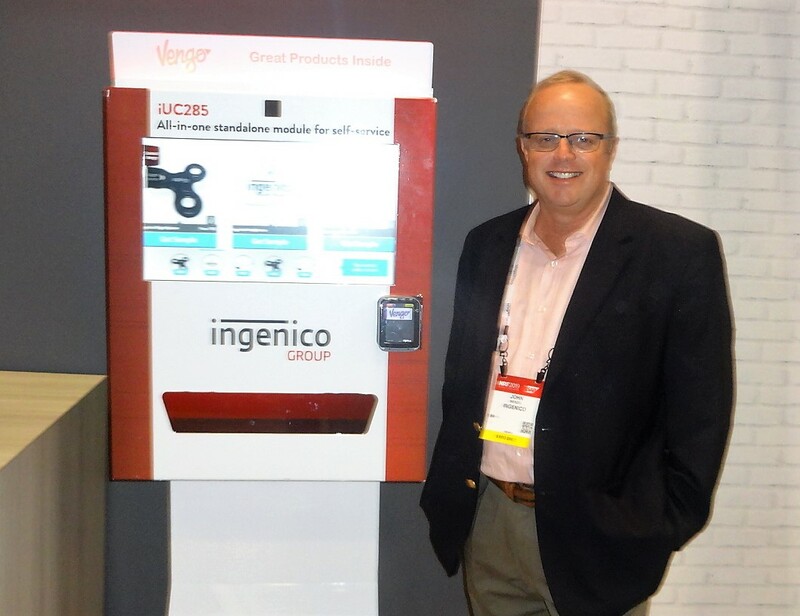 John Menzel of Ingenico Group presents a solution from one of the Ingenico’s unattended partner program partners, Vengo, which provides an interactive vending machine and sampling network. Innovative Foto operates photo booths with digital screens both inside and outside the photo booth in order that offer brands an opportunity to reach consumers. 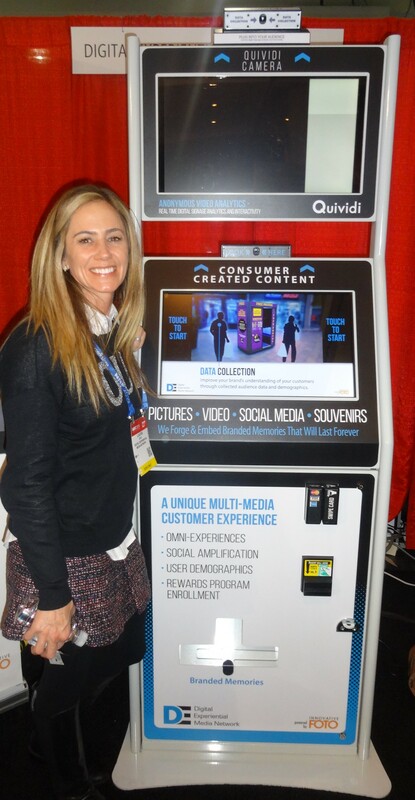 Brands can also offer coupons to customers engaged with the photo booth. Laura Gray demonstrates the Innovative Foto booth. Kiosk Information Systems and its parent company, Posiflex, introduced two standard kiosk offerings. The TK Series features modular platforms with a 32- or 21-inch display. The ParagonT 200 Series kiosk features a 32-inch PCAP display with componentry purpose-built for quick serve and fast casual restaurant order automation (wall mount, single- or dual-sided pedestal). Further, the existing Stellar TK2100 series kiosk has been redesigned as a modular unit with mainstream component options common to most self-service transactions (pedestal or countertop). Both TK models are built with Posiflex components. Kiosk Information Systems also featured two new partner platforms. Bebloo and KIS have collaborated on a digital signage platform empowered with active customer intelligence. The demo showed customer facial recognition and related engagement and demographic analytics, providing scannable digital QR codes empowering consumers to carry store offers, promotions and product information to complete purchases anytime through any channel. A second Kiosk Information Systems partner collaboration — with Bitstop, a provider of bitcoin ATMs — enables instantaneous cash-to-bitcoin purchase transactions with a kiosk UI. 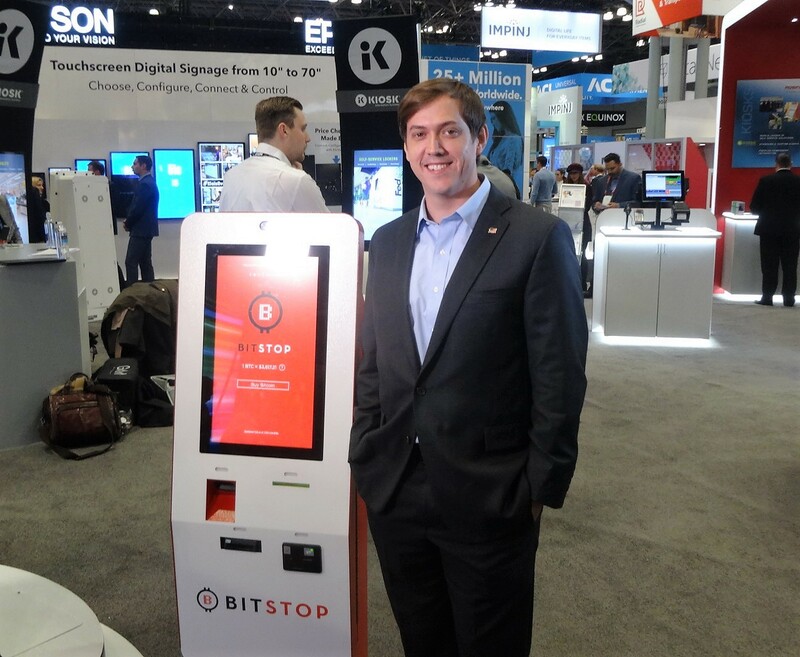 Andrew Bernard presents the Bitstop machine at the Kiosk Information Systems booth. Luxer One, a provider of pickup lockers, demonstrated its smaller locker that is mobile and allows the user to maintain the line of sight. The smaller locker is intended to allow retailers better use of space. The software integrates with numerous retail management software systems. 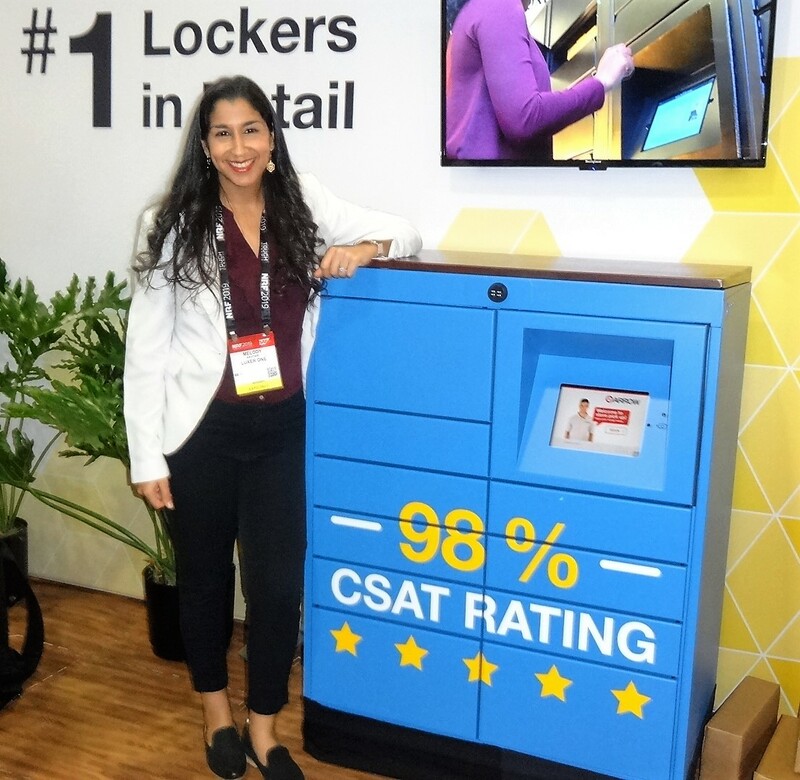 Melody Akhtari presents the smaller locker at the Luxer One booth. Masterwork Automodule Technology presented its restaurant order-and-pay touchscreen kiosk with a facial recognition camera that activates the order process and enables order pickup. The unit accepts cash in addition to payment cards and can give change in cash. The kiosk integrates with a kitchen display system. 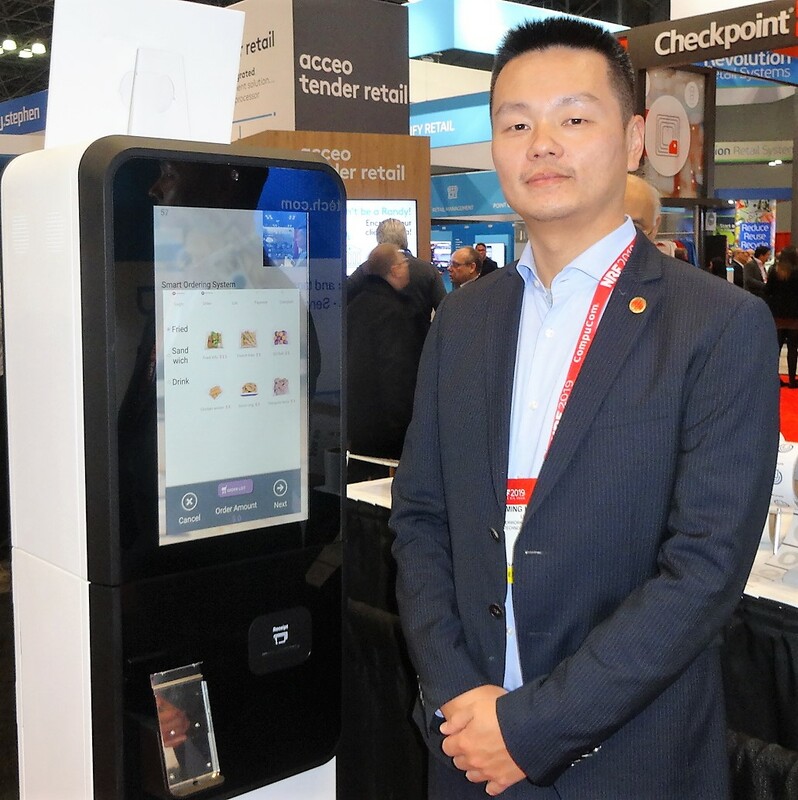 Ming Hsun Liu presents the restaurant order-and-pay kiosk. 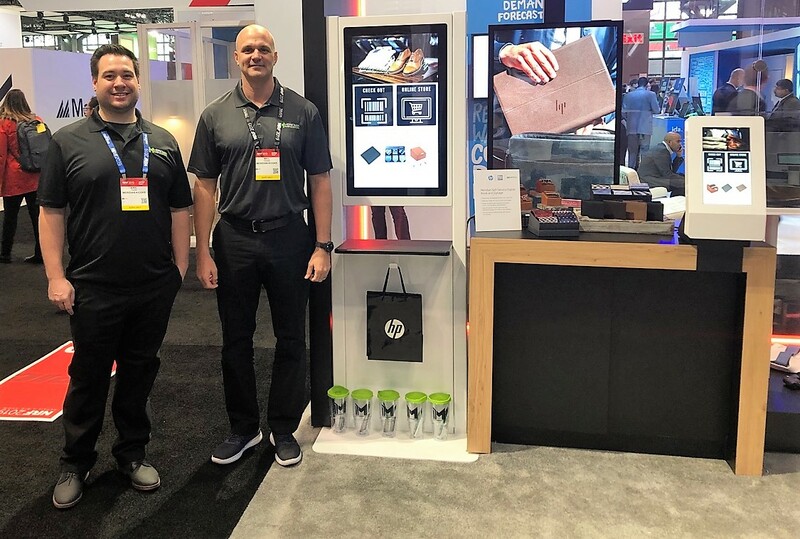 Meridian demonstrated a freestanding unit with a 32-inch touchscreen, as well as a countertop retail unit with a 14-inch screen at the HP booth. While aesthetically different, both units function as three-in-one solutions — with self-checkout, endless aisle and digital signage capabilities. Both solutions were designed to utilize Meridian hardware. The freestanding unit was powered by HP MP9 and the countertop unit was powered by HP Engage 1 All-in-One. Eric Frank and Will Tucker present Meridian kiosks at the HP booth. The AI Kiosk from Nera Robotic serves as an express checkout kiosk, enabling barcode scanning and printing receipts. 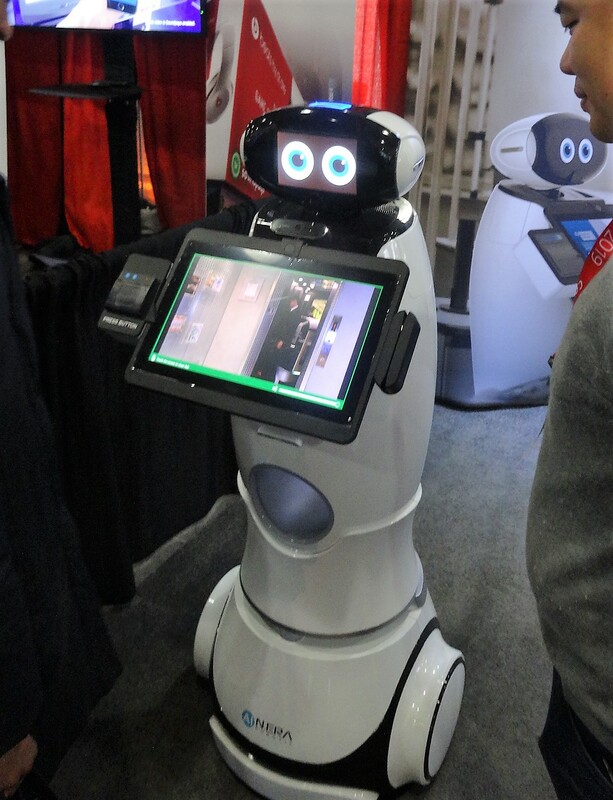 The robot can recognize the gender and age of an approaching customer in order to display customized information. The unit has a touchscreen and features artificial intelligence voice interaction and facial recognition. The kiosk robot from Nera Robotic greets visitors at the trade show. 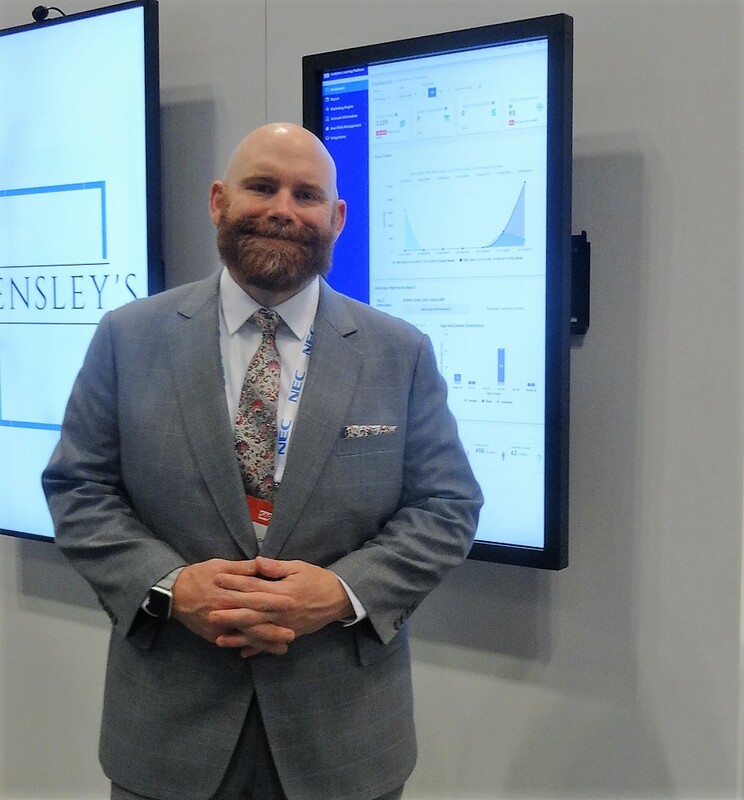 NEC Display demonstrated its Analytics Learning Platform, a business intelligence solution that allows retailers to make data-supported decisions based on overall trends and granular detail. Retailers can know who is visiting their stores, where shoppers are lingering and which targeted messaging is most effective. Cameras detect a visitor’s foot traffic and anonymous demographic data. The data can be paired with store data such as POS transactions and available inventory. The solution uses cloud services and an edge computing device that sends in-store data to the cloud. Rich Ventura of NEC demonstrates the Analytics Learning Platform. Panasonic’s self-order kiosk enterprise-grade application for QSRs features point-of-sale and payment integration, a cloud-based enterprise management portal, flexible screen design, responsive user interface, suggestive selling and order customization throughout the customer ordering journey. 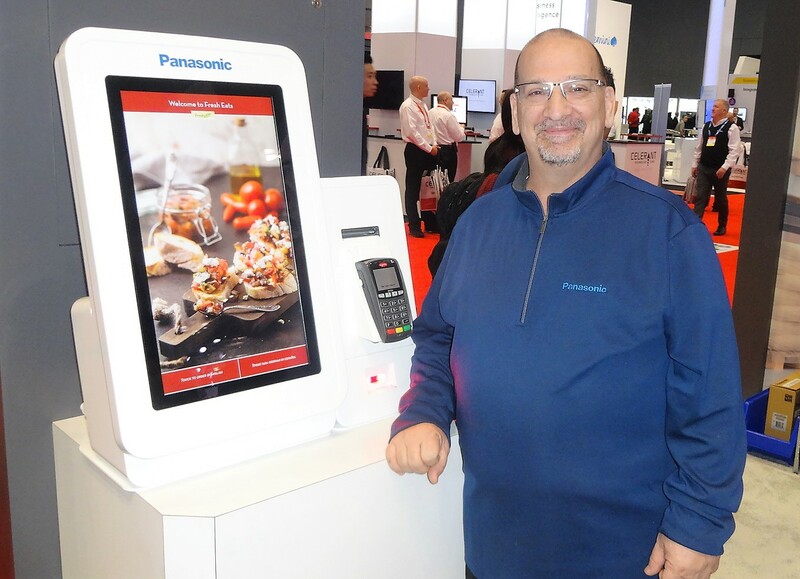 Richard Vale presents the Panasonic self-order kiosk for QSRs. Aileen Klaile demonstrates the Swyft vision checkout payment solution. Touch Dynamic self-serve kiosks for QSRs and retail applications feature a code optical scanner, internal speakers, dual direction identification magnetic stripe reader and an Epson thermal ticket receipt printer. 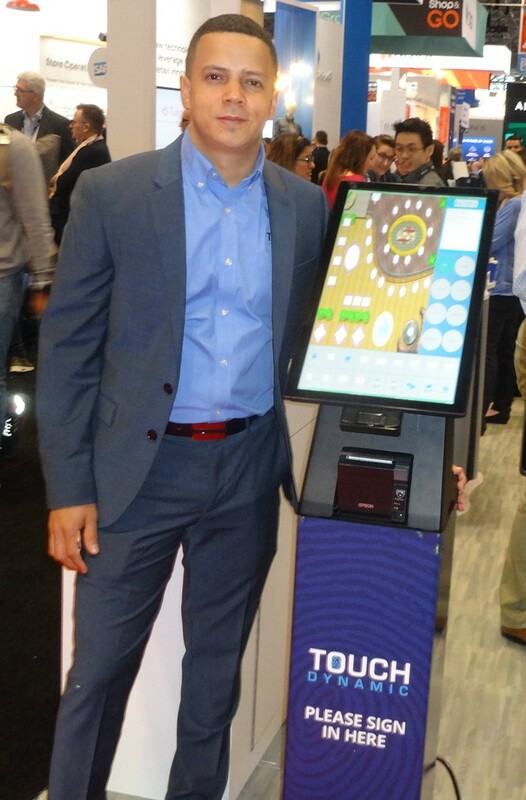 Fausto Paulino presents the Touch Dynamic kiosk. 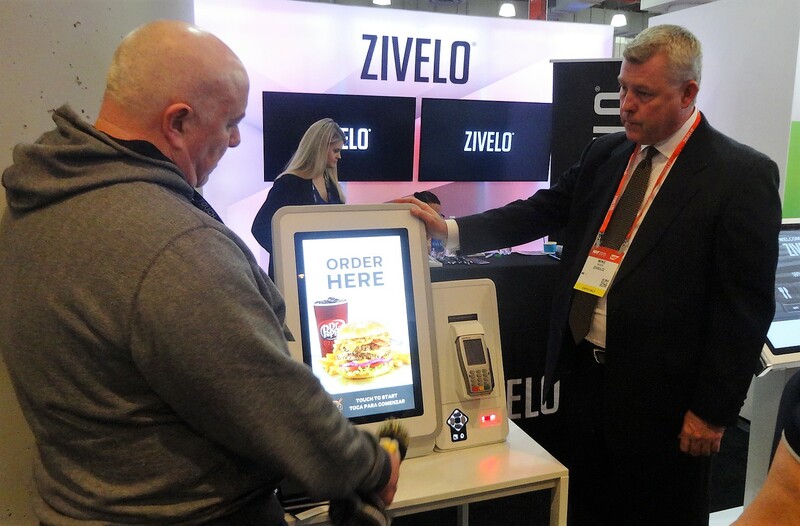 Zivelo demonstrated its X2 Countertop kiosk for QSRs and fast casual restaurants featuring an Intel i5 processor, 4GBDDR4 RAM, Windows 10 Pro 64-bit OS and RJ-4Ethernet or 802.11 ac wireless. The display has a 22-inch projective capacitive touchscreen with 225 nits brightness and a 16:9 aspect ratio. Malcolm Fisher of Domino’s Inc. explores the Zivelo self-order kiosk with Mike Moon.